On Thursday, October 27, the Historical Building of the University of Barcelona held the presentation for the first Declaration of scientific integrity on responsible research and innovation elaborated in Latin countries. The document is written by the UNESCO chairs in Bioethics of the University of Barcelona and the Catholic University of Portugal (UCP) with support from Obra Social "la Caixa" Foundation. The document provides with guidelines to researchers, professionals and other agents of research and innovation. Willing to influence decision-making organisms of the systems of science and technology, it creates a series of suggestions among which there is the application of procedures to identify and confront censurable behaviours. One of the conclusions says that “the current model of research and scientific performance is under economic and academic pressures, non-comparable to previous situations”. 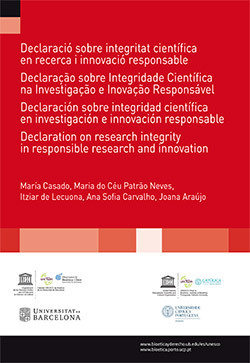 The document was elaborated by María Casado and Itziar de Lecuona, from the UNESCO chair in Bioethics of the University of Barcelona, and María do Céu Patrão Neves, Ana Sofia Carvalho and Joana Araújo, from the UNESCO chair in Bioethics of the Catholic University of Portugal, with the collaboration of Obra Social "la Caixa" Foundation. The Declaration, elaborated from the perspective of the Iberian Peninsula, “with different points of view from the ones usually proposed in the classic Anglo-Saxon area” analyzes the state of matter, proposes a terminological and conceptual clarification and makes recommendations willing to solve existing problems. The text mentions that there is not a scientific integrity definition shared by the scientific community yet, nor a set of agreed principles. It also says that censurable behaviours can be found in all research areas: in supervision, statistics data uses, or in publishing and plagiarism. When assessing the level of an infraction in any of these fields, the document suggests taking into account whether this is deliberate and which negative impact it has in the reliability of science and innovation credibility. The causes of censurable behaviours are separated into individual, organizational –among which there is the lack of “institutional policies that are ethically solid and fair”- and structural ones, like the pressure to get good results and funds to support researches or “appearance of new areas with an undeniable therapeutical potential that create economic, social and media interest, for which there is available finance, more competitiveness”. It then points out the consequences of behaviours ethically censurable, not only for the reputation of the researchers but also for the people who take part in clinical trials and for society in general, since these behaviours create distrust and lack of interest in the processes of knowledge and transfer creation.